Striped sari, by Krishna Mehta; gold ring, cuff, both from Aquamarine. Both in Mumbai. Black floral top, Ashwini’s own. 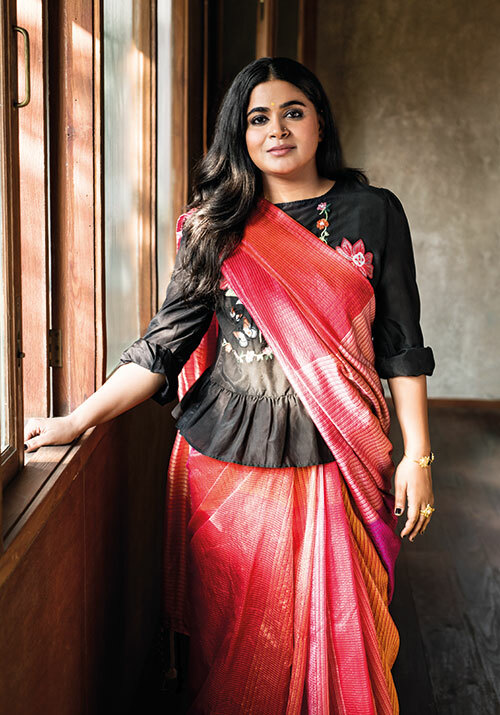 After 14 years with Leo Burnett, Ashwiny Iyer Tiwari quit her job as executive creative director. While she told stories for many of India’s biggest brands, it was her work on a commercial for Kaun Banega Crorepati, centred on the girl child, that changed the way she approached them and made her want to tell them on a wider platform. A few short films later, she made her feature length debut with the critically acclaimed and heartwarming Nil Battey Sannatta (2016), which she directed and co-wrote with her husband Nitesh Tiwari.